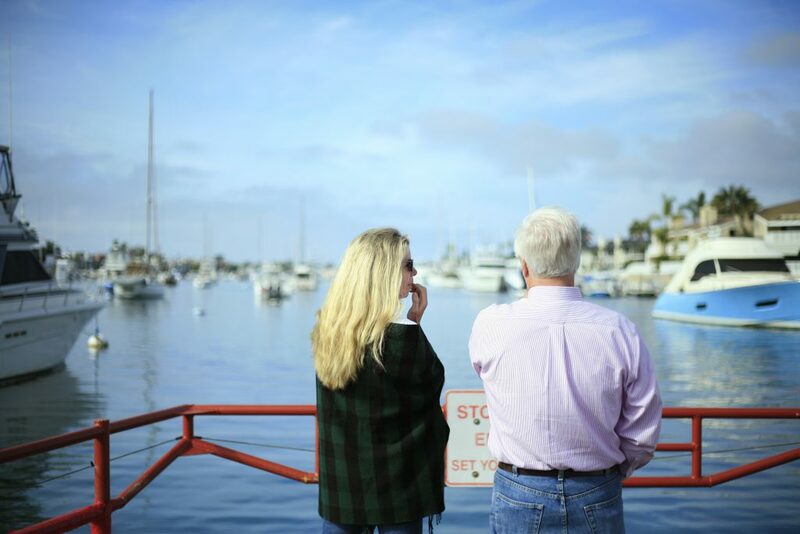 Residents look over the water during the Harbor Commission ferry tour on Saturday. 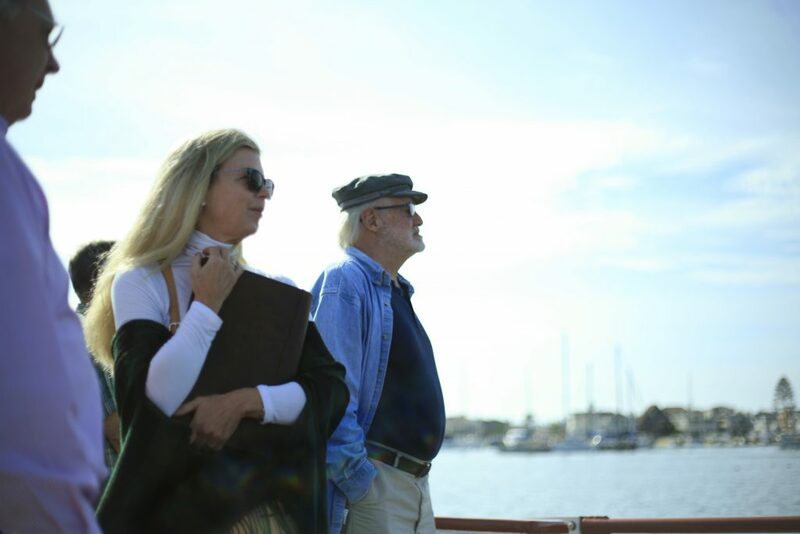 Residents interested in Newport Harbor got an on-the-water overview of current issues and projects from the officials over the weekend. 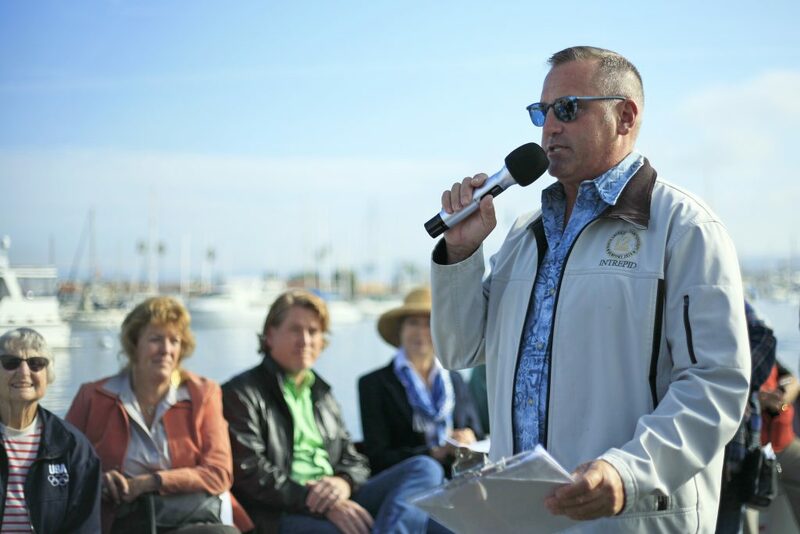 Newport Beach Harbor Commission hosted their biennial special ferry tour meeting on Saturday. About 50 people attended the meeting, which launched out of Marina Park on the Balboa Peninsula. 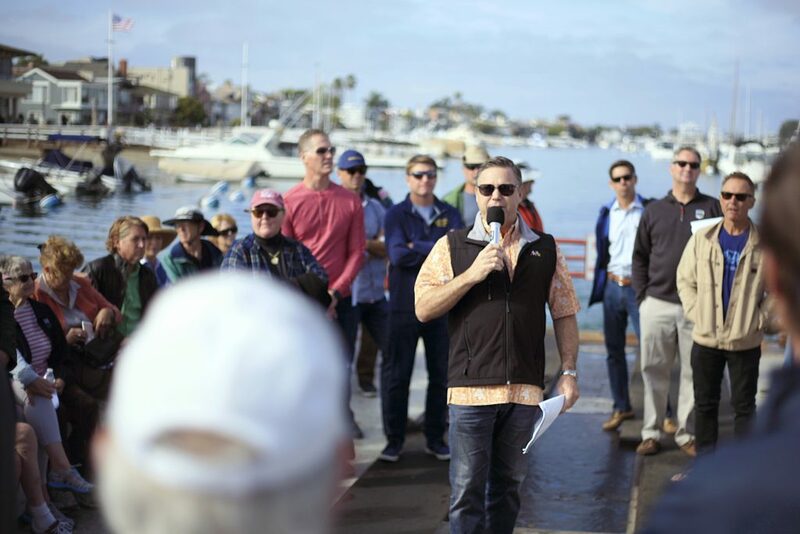 Six commissioners discussed harbor-related topics as one of the Balboa Island ferries cruised approximately 6.7 nautical miles around Newport Harbor. Commission Chair Dave Girling was absent. 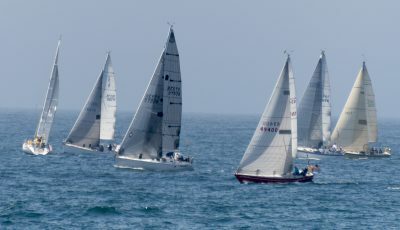 The most notable topic of the morning was the upcoming revisions to Title 17, the section of the city’s charter and municipal code that covers all harbor activities. They will be considering all aspects of that section of code as they look into what might need updating, Commissioner John Drayton explained. Commissioner John Drayton talks about derelict vessels in Newport Harbor during the tour Saturday. Several commissioners emphasized that it will be a public process with plenty of opportunity for input from residents, harbor users, and other interested parties. Public participation will be encouraged, several noted. The most recent impact to this section of city code is the creation of the new Harbor Operations Department, Commissioner Don Yahn noted. 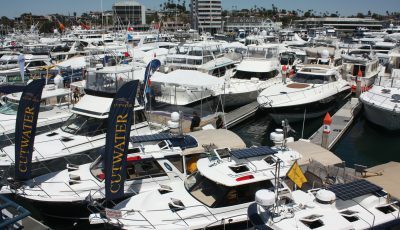 The city took over management of the moorings from the Orange County Sheriff’s Department Harbor Patrol last year. 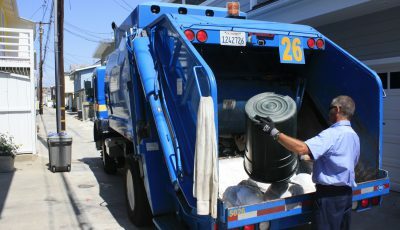 More recently in July, the city rearranged and merged harbor-related services, responsibilities, and positions, and created the new Harbor Operations Department. As part of the changeover, the city took over responsibility for city code enforcement, Drayton explained. Law enforcement is still the responsibility of Harbor Patrol. “We’ve got a really good, cooperative relationship going with the Sheriffs,” Drayton said. Dennis Durgan has been filling the role of Harbormaster for the past year and a half, but when the departments merged a new permanent, full-time position was created. The city received 42 applications and interviewed a handful of finalists on Oct. 18. The city is in the final stages of hiring a permanent harbormaster and should be making an announcement soon. 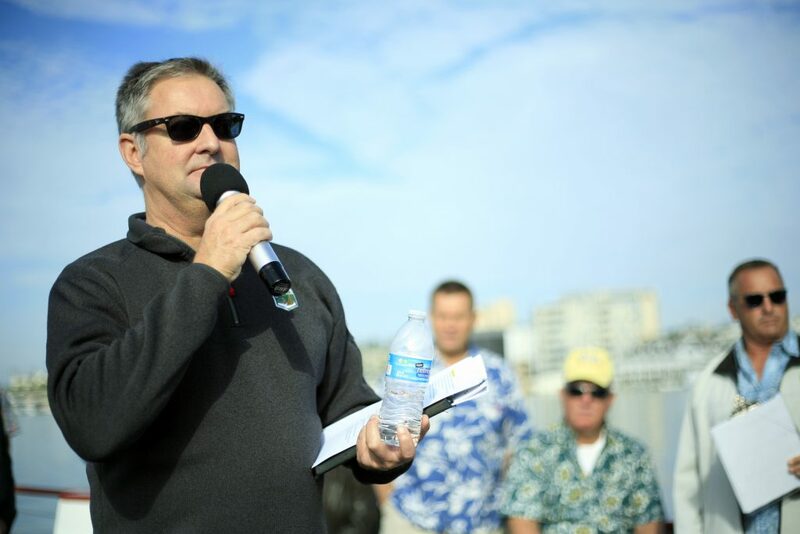 Harbor Commissioner Don Yahn talks about Newport Harbor-related issues during the ferry tour on Saturday. As the ferry cruised under the Lido Bridge, Commissioner Bill Kenney discussed an issue that returns every summer, but made a much bigger splash in 2018 than past years: Bridge jumpers. “It’s always been an issue, but it really came to a head,” this summer, he noted. There was a group that tried to set a world record for the most people consecutively jumping off a bridge, Kenney said. In another instance this summer, a bridge jumper landed on a duffy boat and injured a woman onboard. Cody Green, 27, of Costa Mesa was arrested July 27 and charged with assault and felony vandalism. Kenney mentioned some of the deterrent methods used by the city recently. In addition to the longtime signage, including posting lifeguard staff near the bridge, a rescue vessel on the nearby beach, and two buoys warning boaters. “For the time being, we were able to curtail the bridge jumping,” Kenney said. They will have to address it again next summer, he added. Harbor Commission Vice Chair Scott Cunningham discussed both deepwater and nearshore dredging. 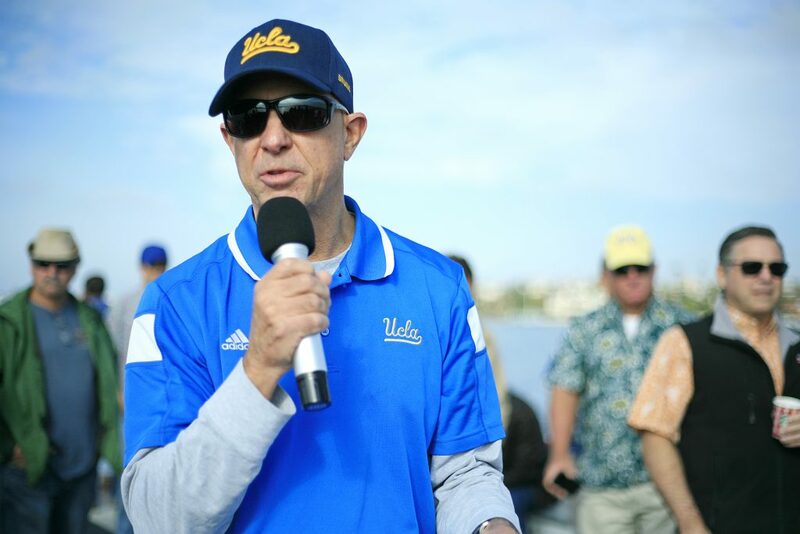 Newport Harbor is overdue for another dredging project, he pointed out. Currently, about 1 million cubic yards needs to be dredged in order to bring it back to its original design depth. 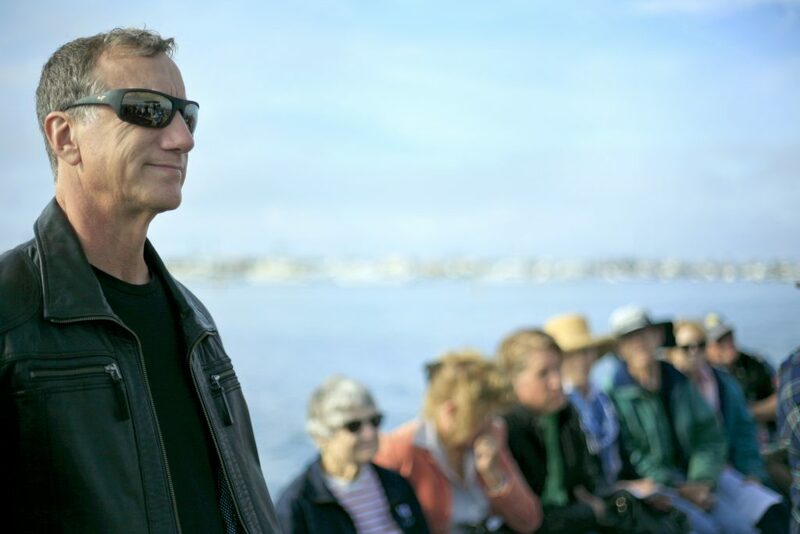 Commission Vice Chair Scott Cunningham talks about dredging Newport Harbor during the tour Saturday. There are two major tasks involved with the project: Funding, and disposing of about 200,000 cubic yards of unsuitable material that can’t be placed offshore. Total cost is estimated to be about $22 million, Cunningham said. The good news is the city is working with the Army Corps of Engineers, who have submitted some initial funds to start the design and environmental study, he confirmed. The aim is to develop a sustainable, low-cost maintenance dredging program, possibly tying it in to the private dredging work done around the harbor in an effort to drive down costs. 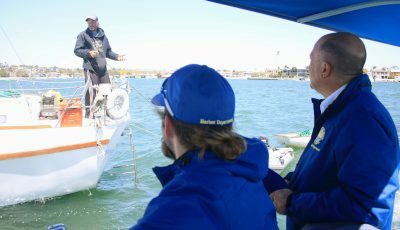 They have looked to other harbors for ideas, he explained, including a pipeline system to deposit material offshore, an idea that has floated around Newport Harbor for a few years. Commissioners also talked about code enforcement, mooring size modifications, stand up paddle board safety, alternative anchorages, liveaboards, speed limits, permits, derelict vessels, trash-collecting water wheel, the overall harbor vision, and more. 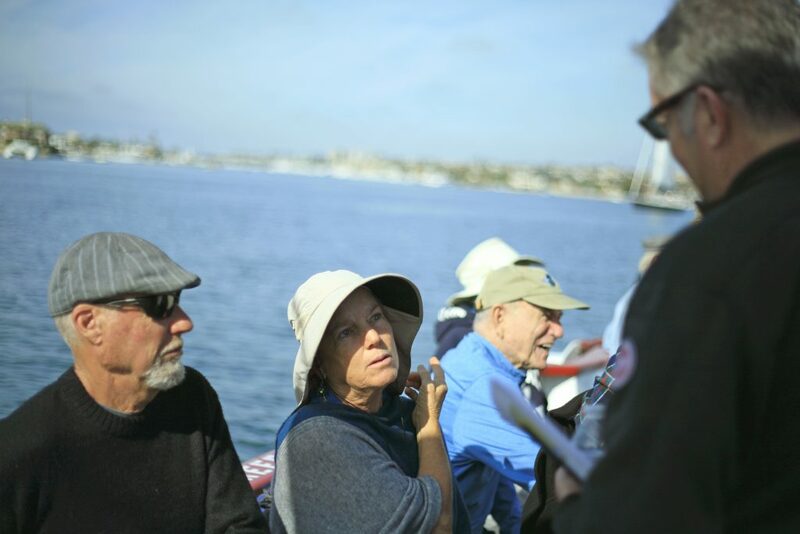 Residents talk with Commissioner John Drayton during the tour of Newport Harbor on Saturday. 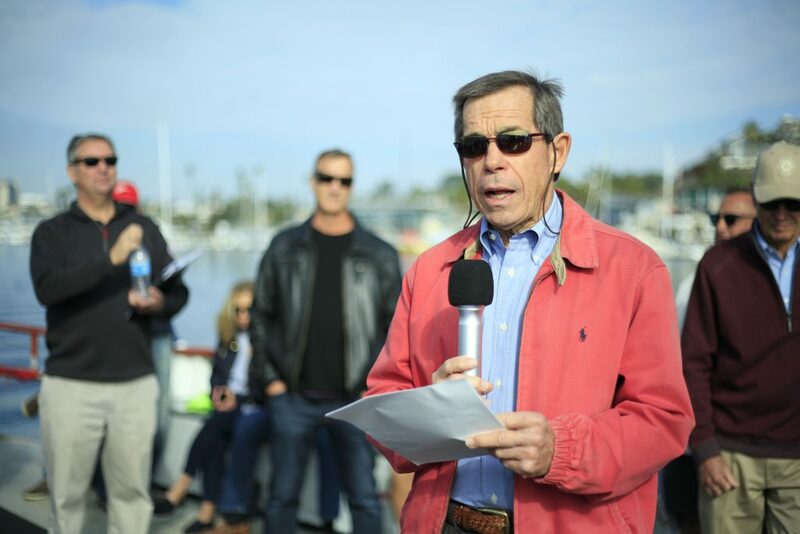 Harbor Commissioner Bill Kenney talks about current projects in Newport Harbor during the ferry tour on Saturday. 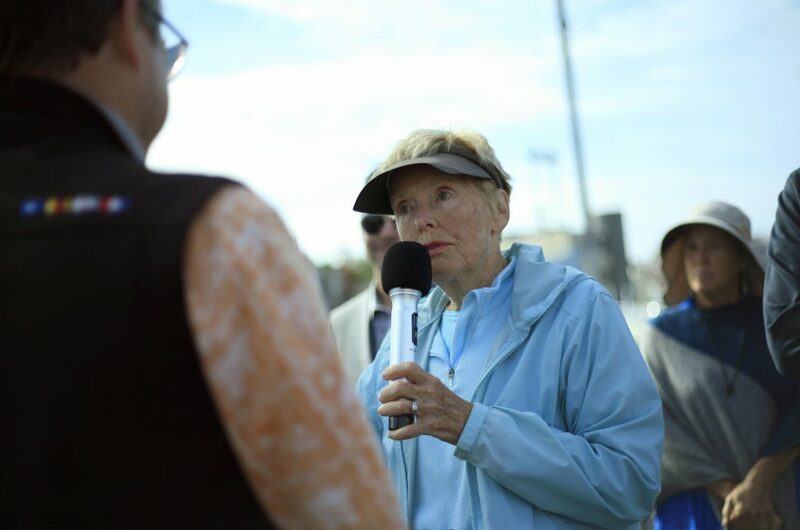 Longtime Newport Beach resident Nancy Skinner asks a question of Harbor Commissioner Don Yahn during the tour of the harbor meeting on the Balboa Island ferry on Saturday. Commissioner Paul Blank talks about the overall vision for Newport Harbor during the tour Saturday. Harbor Commissioner Ira Beer and guests during the tour Saturday. 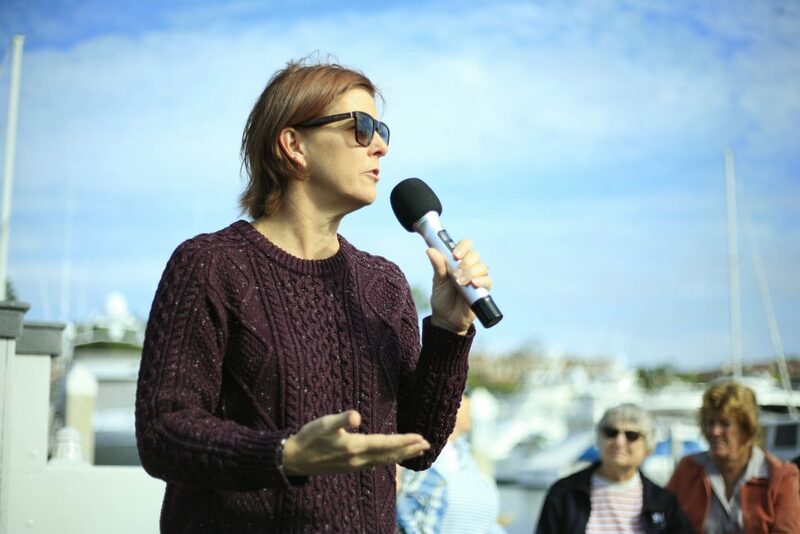 Assistant City Manager Carol Jacobs talks about the solar-powered, trash-collecting water wheel proposed for the bay during the harbor tour Saturday. 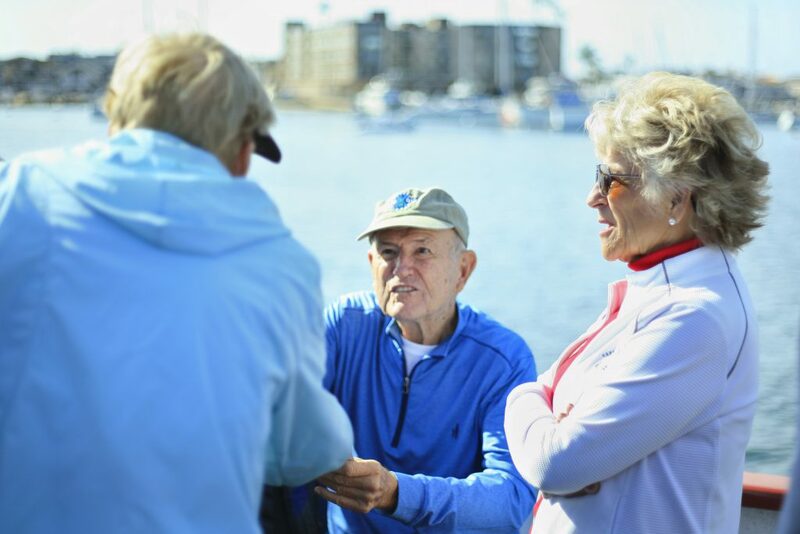 Soon-to-be City Councilwoman Joy Brenner (right), and longtime residents Jack and Nancy Skinner chat during the Harbor Commission tour on the ferry on Saturday.